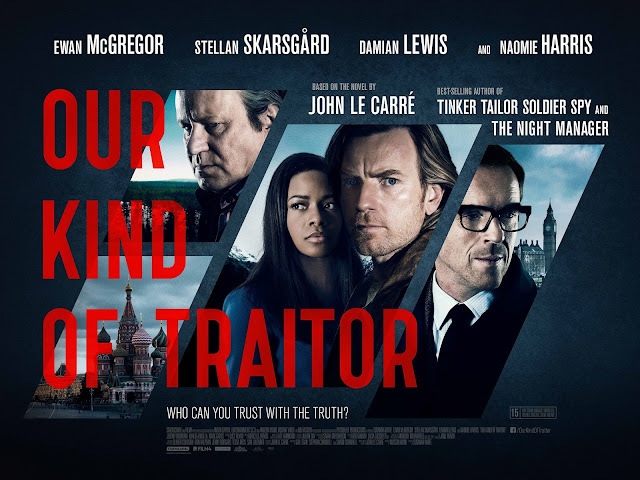 Our Kind of Traitor is a 2016 British spy thriller film directed by Susanna White and written by Hossein Amini, adapted from John le Carré's novel of the same name. Starring Ewan McGregor, Naomie Harris, Stellan Skarsgård, Damian Lewis, and Alicia von Rittberg, the film was released in the United Kingdom on 13 May 2016 by Lionsgate. "As part of a plan to launder billions of dollars in London, ""the Prince"" - the head of the Russian Mafia - creates a new bank and has its financial oligarchs sign over their accounts to him. The first oligarch to do so is murdered alongside his family by a blue-eyed assassin. Poetics lecturer Perry Makepiece and his barrister wife Gail are on a holiday in Morocco to try and salvage their marriage after Perry slept with one of his students. Perry strikes up a friendship with Dima, a hearty and boisterous Russian with an eidetic memory. The two men bond over drinks and tennis before Dima invites both Makepieces to his daughter's birthday. At the birthday party, Dima gets Perry alone and gives him a USB stick that links corrupt British politicians and businessmen to the Russian mafia. He fears for his life after hearing of his fellow oligarch's fate, and pleads with Perry to turn the USB stick over to British MI6 when he returns to London. Perry turns the information over to Hector, the investigator in charge. The information provided by Dima enables Hector and his supervisor Billy to witness a meeting between the Prince and Aubrey Longrigg, a senior politician whom Hector knows is corrupt but has never been able to prove it. Billy refuses to sanction an investigation on a chance meeting. Hector continues regardless and recruits the Makepieces to help stage a chance encounter with Dima in France. There, Dima provides all the names of the corrupt, but refuses to provide the bank account numbers that would verify the corruption, until he and his family have been granted asylum in London. Emilion, the Prince's consigliere, suspects the Makepieces and has henchman Niki intimidate them by bringing them to his rough neighbourhood. Whilst there, the blue-eyed assassin beats a woman and Perry attacks him in fury. Gail is touched by her husband's protectiveness of others and their relationship begins to heal. Hector reveals to the Makepieces that he only has two men and that he has been funding the operation himself, and they plan to seize Dima and his family simultaneously after Dima has signed the accounts over to the bank. Gail successfully retrieves Dima's wife and children, whilst Dima kills Niki before Perry can find him and bring him to safety. Whilst at the airport, Billy calls Hector and informs the family is denied asylum until Dima is sent on first. Dima refuses and Hector sends everyone to a safehouse in the French Alps. While there, Dima's daughter blows their cover by calling one of Dima's bodyguards, by whom she is pregnant. The blue-eyed assassin leads an attack on the safehouse, but it is fended off by Dima and the agents. Dima chases the blue-eyed assassin into the woods, but is ambushed and almost beaten to death before Perry arrives and kills the assassin. The attack convinces Dima to go on ahead, but at the last minute he makes Perry promise not to come with him. The helicopter takes off and explodes, killing Dima, and devastating the Makepieces and Hector. The mafia bank begins trading at massive profit, and Perry visits Hector at home and gives him the ornate pistol that the Prince gave Dima upon the signing of the accounts. After Perry leaves, Hector finds a tiny roll of paper with the list of corrupt Britons' accounts hidden in the pistol's chamber."